Can Blues topple Collingwood monster ? Why can't Saints win ? Is Tigerland the new wowser state ? How many Abletts do the Suns need to win ? Is Giants a nickname for Midgets ? Can Swans get another flag ? Do the Lions have more ranga' s than any other AFL team ? Have the Dogs lost their bite ? What is the Kangaroos shinboner spirit ? Will the Crows stop crowing ? Why are Freo purple ? Do Port like their new footy jumper ? Are West Coast Eagles to be 2012 Premiers ? Does anyone follow Melbourne anymore ? Why are Essendon always so cocky ? Are Geelong running on empty ? Is there a Hawthorn without Buddy? All will be revealed , as fans , watch the footy , in their football jumpers , jerseys , guernseys . 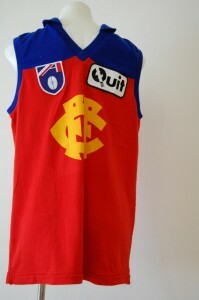 This entry was posted on Friday, July 6th, 2012 at 11:09 am	and is filed under AFL, football jumpers, NRL. You can follow any responses to this entry through the RSS 2.0 feed. Both comments and pings are currently closed.